or have a sedentary lifestyle due to a pregnancy, sitting for prolonged periods of time can cause great discomfort. The wrong body posture, the poor blood circulation, the pinched nerves, and the pressure usually lead to body pain. This amazing seat cushion will help you rest comfortably, and help maintain a correct body posture for hours! providing you with excellent support. The revolutionary design assures unmatched comfort. The thick memory foam will allow your body to gently sink in and enjoy maximum comfort for as many hours as you wish to remain seated. 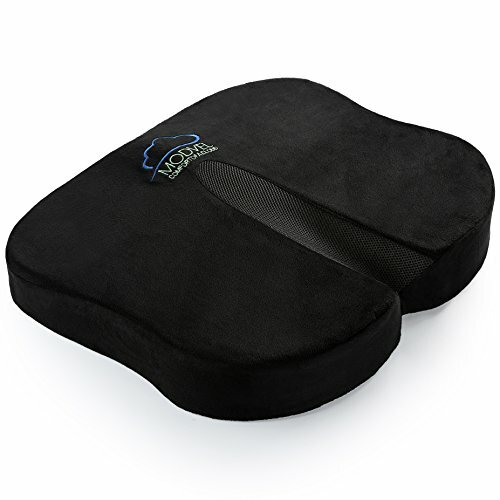 this seat cushion will help you relieve lower back, coccyx, sciatica, joint pain, as well as pressure soreness. In addition, it will improve your blood circulation. on your car seat, in the airplane or bus, on the floor, and anywhere you want to sit. as we will provide a full refund if you become dissatisfied with this item for any reason within 30 days of usage. ✔ REST COMFORTABLY AND FORGET ABOUT PAIN AND DISCOMFORT: Nowadays, most people have a sedentary lifestyle which can cause coccyx problems, back pain and soreness. If you have been looking for an effective way to protect your body and enjoy unmatched comfort, you have come to the right place. This amazing memory foam seat cushion is exactly what you need. ✔ MADE WITH THE HIGHEST QUALITY MATERIALS, BUILT FOR HOURS OF: Infused with raw coffee bean extract and castor natural seed oil to naturally remove odor & bacteria. This seat cushion has been carefully designed to properly support your body, allowing you to maintain a correct body posture, relieve lower back, tailbone and sciatic nerve pain. In addition, it will ease the pressure of the thigh blood vessels and it will help with hemorrhoids and herniated disc problems, pregnant women. ✔ CARRY YOUR SEAT CUSHION WITH YOU ANYWHERE YOU GO: This extremely versatile seat cushion will provide you with countless possibilities. The compact, lightweight design and the carry handle will allow you to take it with you anywhere you go. Use it at home, at the office, in your car, while travelling, during picnics, at the beach, at a festival, at a match, at a concert or on a wheelchair! You name it! ✔ INCOMPARABLY EASY TO USE AND KEEP CLEAN: Forget about cheaply made cushions that slide and which offer no support. This must have indoor and outdoor foam cushion will allow your body to gently sink and enjoy excellent support. The slip resistant bottom fabric will keep the cushion in place. Moreover, the high-quality zipper will allow you to remove the cover and wash it any time you want to. If you have any questions about this product by Modvel, contact us by completing and submitting the form below. If you are looking for a specif part number, please include it with your message.